If you follow any news about social media you have likely heard that the Facebook algorithm has been tinkered with a lot lately. Facing an increasing backlash from politicians and others, social media giants like Facebook have come out publicly to say they want to improve the user experience so we aren’t bombarded with so much content designed to get our temperatures rising! “Because space in News Feed is limited, showing more posts from friends and family and updates that spark conversation means we’ll show less public content, including videos and other posts from publishers or businesses.” – Facebook Newsroom. While this is admirable and necessary it seems that business pages have fallen into the same pot as Russian trolls and other abusers of Facebook. Many observers had already claimed organic reach to be dead on Facebook so Mark Zuckerberg’s desire to ‘fix Facebook‘ can be seen as the final nail in the ‘organic reach coffin’. So does that mean Facebook has become irrelevant for businesses wanting to engage with their customers, reach new markets and show off their product or service? Absolutely not. What these changes to the Facebook algorithm have done is focus social media managers like myself to become even more creative, work even smarter with our clients and listen to Facebook and their advice on how to get the best out of any Facebook page. 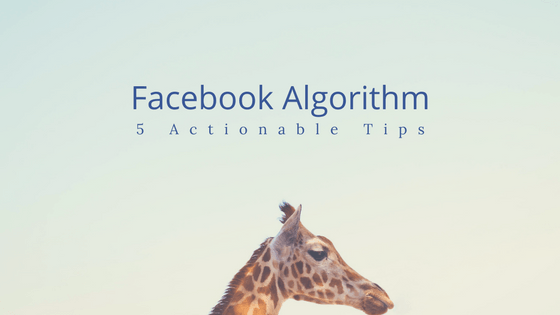 Check out 5 actionable tips you can start working on today to help boost engagement and beat the Facebook algorithm. 1. Facebook Live – The fight for video views seems to be the social media battle of our time. Facebook are in the thick of it, trying to get you to watch content on their platform versus YouTube, Twitter and even Instagram (which they bought in 2012). This means if your company goes live on Facebook with a product announcement, event or simply a way of sharing news with your page followers, you will enjoy better reach than other types of Facebook posts. The stated reason for this is that “live videos often lead to discussion among viewers on Facebook – in fact, live videos on average get six times as many interactions as regular videos.” So build Facebook Live into your social media content plan and do it soon! Does it offer value to your target market? Is it relevant to people who have liked your page? Does it answer common questions your business receives? Will it delight your audience and invite engagement? Will this post generate comments? 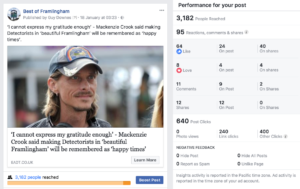 This post generated comments and shares – two great ways to increase reach for your page. 3. Positivity Always – Having worked in social media marketing since 2009 there is one rule that has remained consistent; positive always wins. That’s not to say your business has to become the Dalai Lama of Facebook! However, if you post photos of staff members you will be surprised the difference genuine smiles will bring to your engagement stats. Emphasising how your product or service makes things easier, helps people out or simply improves someone’s day is huge. This naturally leads us to client testimonials. If you can shoot a 30 second video of a customer saying what they love about your business that is natural and doesn’t feel ‘set up’, you will be on the right track. 4. Use Facebook Tools – A Facebook page has many options businesses don’t seem to be taking advantage of even today. Expand your post types and use Facebook Notes to write company blog posts. If you have a sale, use ‘Create Offer’ (very sharable content when the offer is significant) as a post type instead of simply typing the deal into a post (of course Facebook Live is perfect to announce deals too). A fun new feature Facebook now offers is to create a poll on your page using photos of gifs … this is perfect for getting customer feedback on a product or just having a little weekend fun with gifs. 5. Pay to Play – Forgetting the Facebook algorithm for a minute, Facebook ‘marketing for free’ ended years ago. If you are an admin on a page you are probably already running ads and boosting posts. This is key to any advertising strategy on Facebook but remember to explore and test. Boost events, advertise video views (one of the best ad values available on Facebook) if a video did particularly well on your page. Always check your insights to see which posts have been performing better than average organically and boost those. The key is variety. Don’t rely on a couple of boosted posts per month that you hope will do well because you happen to like them. Check insights, split your Facebook advertising budget across various ad styles and vary the demographics you target. Test, test, test! The changes to the Facebook Algorithm are a reality for any business on Facebook but it’s not necessarily the terrible news you might have thought. It offers you or your social media manager a chance to get really creative, pushing your business to improve, to show its very best content to the outside world. When we focus on quality and analyse results, things often improve beyond what we expected.